Dubai’s booming cruise sector has enjoyed its best season to date, with more than 625,000 cruise tourists visiting the city during the 2016/17 season, according to data issued by peak industry body Dubai Cruise Tourism. The result marked a 15% improvement compared to the 2015/16 cruise season. A total of 157 ships made calls at Dubai’s state-of-the-art cruise terminal at Mina Rashid Port this season, marking an 18% year-on-year rise. Dubai’s 2016/17 cruise season officially concluded with the departure of the C.S. Sea Princess from Mina Rashid on June 8. 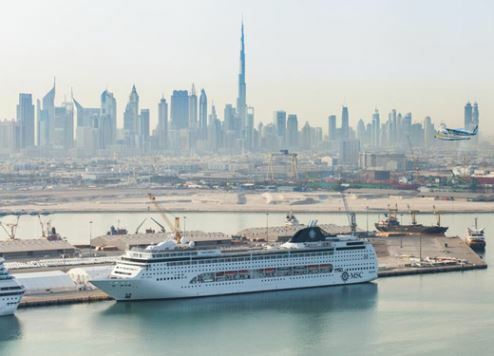 The luxury liner and its 3,000 passengers visited Dubai as part of a 104-night cruise around the world, which started in Brisbane, Australia, on January 7. Highlights of the 2016/17 season included Thomson Cruises becoming the first UK-based cruise operator to home port in Dubai, along with eight maiden ship calls, headed by inaugural visits from TUI’s Mein Schiff 1, Norwegian Cruise Line’s Norwegian Star and MSC’s MSC Fantasia. Dubai is currently working to further improve cruise facilities at Mina Rashid Port. A new bridge designed to connect terminal 2 and 3 is being constructed, while new quays are being added. Existing quays are being expanded and an additional terminal will be built for more capacity to accommodate the increasing number of cruise ships. Dubai’s 2017/18 cruise season will commence on 25 October, with the arrival of Seabourn Encore. P&O Cruises recently confirmed it will home port in Dubai for the first time this coming season.